Today, Evil takes over this blog. 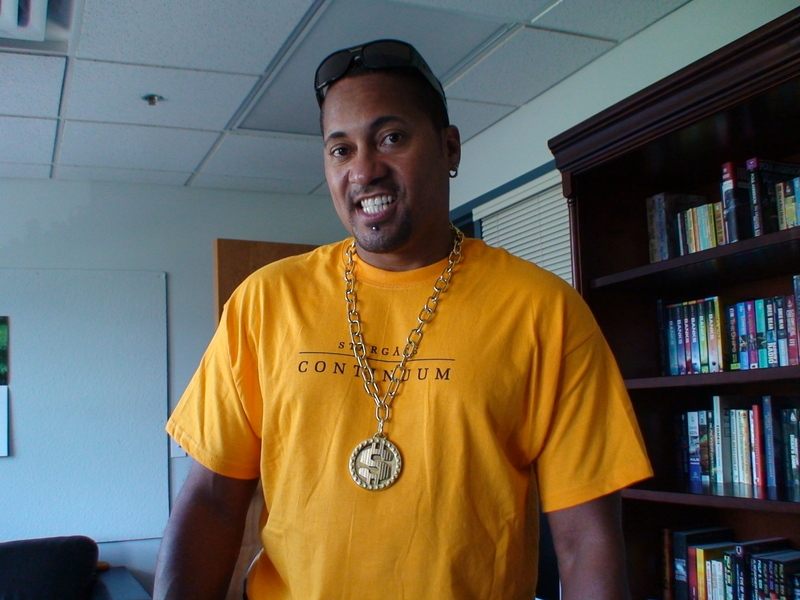 And by Evil, I am, of course, referring to “Evil” Kenny Gibbs, our Stargate Atlantis Props Master. Kenny a.k.a. Evil a.k.a. Yellow has been with the show as long as I can remember and it’s a pleasure to have him drop by for a little meet ‘n greet. While you’re enjoying Kenny’s little show and tell, start thinking up questions for our next guest, Mika McKinnon who, as part of the props department, has been our physics consultant for the past two seasons. So, start posting questions for Mika, enjoy Evil’s Q&A, and scroll down to the bottom of the Kellerific mailbag to check out The Weird Food Purchase of the Day: Durian! 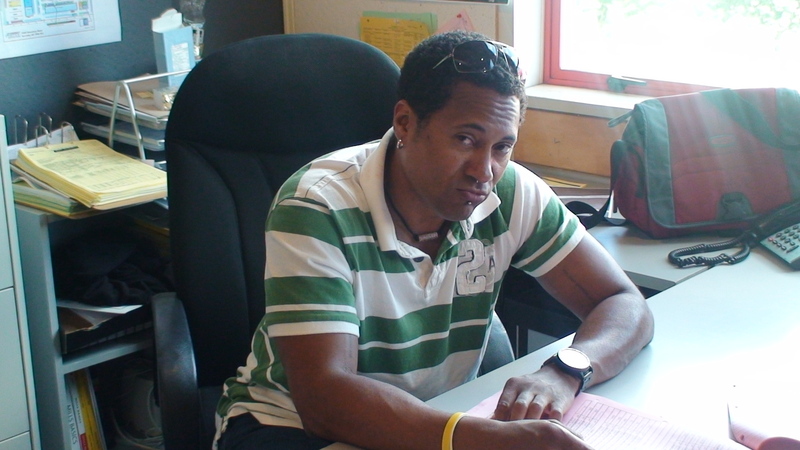 Airelle writes: ““Evil” Kenny Gibbs— what is the evil in your name referring to? A-‘evil’ was a nick name given to me by my nemesis…Martin Wood ( Martin and I are actually very good friends to tell the truth ). It was my first season on the show and everything was really great until we started shooting “Upgrades”. The main prop was an alien (Tok’ra I think ) arm bracelet device that would ‘upgrade’ a person’s abilities when worn. The prop was very tempermental ( I’m being nice…). Near the end of the episode, Martin called for a remote control version of the arm bracelet to be brought to set. Since he was sure the bracelet wouldn’t work he called it evil…then he called me evil. I brought in the prop, positioned it and activated it for a test. It didn’t work. I looked up, walked over to Martin and said “whatever” and walked away. Everyone laughed, including Martin. The name has stuck ever since. How do you make those amazing props>? I know its not all smoke and mirrors, but a little magic? Have you had to fashion any prop that you scratched your head and said, #$%^&*$…? A-Those amazing props are conceived and created by an amazing group of people. Our Production Designer ( James Robbins ) starts the process, and our model shop brings the drawings to life. The shop is lead by Gordon Bellamy, who has been with the show for years ( btw, he had very little to do with that arm bracelet ). The talented group that he supervises is a mixture of engineers, sculptors, machinists and inventive builders. They are the true magicians that make my job fun and rewarding. How does the stargate turn)(if thats your dept)? 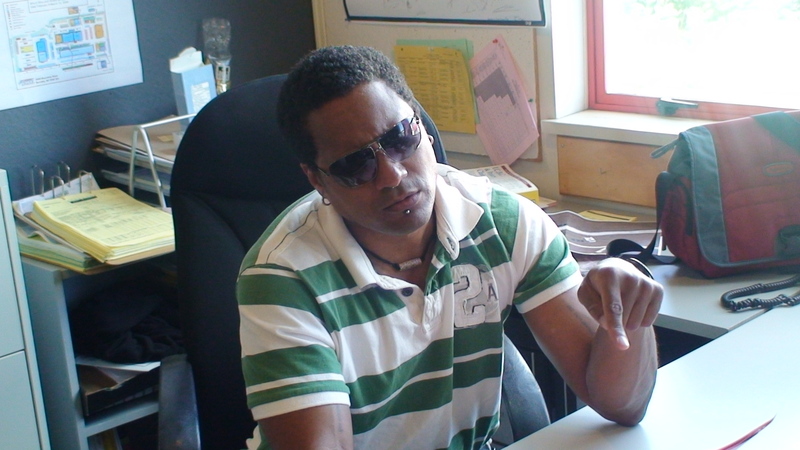 A-The mechanics behind the gate’s practical function is handled by our SPFX department lead by Wray Douglas. Another great team and amazing professionals. A-Power tool huh? Being the ‘office guy’ now, I don’t handle tools or weapons as often as before. I guess I would have to say my 24v cordless Bosh circ saw or drill. They always get the job done ( did that sound like a commercial ? ). Antisocialbutteflie writes: “1) How much do you have to creatively recycle the same props over again? A-Once an episode has aired, we’re free to reuse and modify existing props. It happens quite often. A-I’ve always been the kid of kid who wanted to know how things worked and loved adventures. Building forts and gizmos was how I kept myself entertained as a kid. I always loved watching action and adventure movies growing up, so I actually thought I’d grow up to be a cop. 1). What are your favorite materials to work with when creating props? A-Hmmm, that’s a tough one. All of our props vary in the materials used to create them. I guess I would have to say aircraft aluminum. We’ve built a few sword over the years and what we’ve been able to create with aircraft grade aluminum has been fantastic. 2). How challenging is it to develop props for science fiction? A-I think I’d describe it as an adventure in problem solving. Today’s technology makes almost anything possible. Building practical props that would survive an episode ten years ago was challenging. Working with people that are as talented as the group we have is just plain fun! 3). Are there any props that regularly “grow legs and walk away”? I can only imagine actors may become attached to a cool prop and … well … you know. A-Props that ‘grow legs’ are as common as surfing the internet! Implementing precautions to prevent them from walking is the hard part. We grow attached to our own props as much as the actors that use them. It all comes down to the value of the prop when it comes to giving parting gifts to actors…usually it doesn’t happen. We do our best to wow you guys and our producers….you’re welcome. Jess writes: “1) Are all the show’s prop’s made from scratch or do parts of old or brought thing’s get worked into them??? A-Most of our props are made from scratch. Trying to re-create an existing prop into something else in usually more time consuming and costly. We still recycle whatever we can but in most cases we build from scratch. A-Boy, nothing gets by you guys. The monkey. Do I really want to tell you about Baba-lou….okay. Back in the SG-1 days we did an episode called ‘Absolute Power’ ( I hope I’m right about the episode ). Michael Shanks’ character dreamt he was taking total control of earth or something like that. He had a scene where he was in the SGC infirmary and my prop master thought it would be a funny joke to put a stuffed toy in the bed to keep him company. When Michael found Baba-lou, he immediately embraced the joke and he wanted B around for the rest of the episode as the set mascot. It became my responsibility to make sure B was there so I wore him everywhere. The cast and crew became attached to B and I ended up wearing him for the rest of the season. Baba-lou had his own fans too. Corin Nemic’s daughter liked B so much she made her dad buy B clothes when they were on vacation one summer hiatus! Where’s B now? He’s retired from set life and is presently….hanging beside my desk. Chelle deBeor writes: “Why “Evil” ?? How did that name come about? A-Yeah, again thanks to Martin Wood. A-I’m a bit of a prankster I’ll admit. I usually try to keep things light at work. When I was on set I think the worst prank I pulled was on our AD department. I tricked our 3rd AD into running from a location base camp to set by imitating his boss ( 1st AD ) on the walkie. The poor guy was exhausted by the time we broke for lunch!! Sulien writes: “Questions for Evil Kenny Was there a specific TV series or movie that inspired you to go into the Business as a props maker? If so, which one? A-I’ve always had a passion for sci-fi and action ever since I can remember watching movies. It was tv shows like ‘Batman’ ( with Adam West ) and the original ‘Star Trek’ did it for me. I was also a comic book kid. My favs, ‘Luke Cage-Power Man’ and the ‘Fantastic 4’. What has been your personal favorite prop that you had a hand in making (Stargate related or otherwise)? A-My favorite Stargate prop would have to be a toss up between the ‘replicator disruptor’ used by RDA in SG-1 or the hero swords used in Blade 3. Guns and swords. Love em! What is your favorite prop from a series/movie that you haven’t worked on? A-The only prop that gave me ‘prop envy’ was the cool props that the ‘007’s always have! The Bond props rock!! Which prop was the hardest to make? A-I don’t think I can remember what was the hardest thing for the boys at the model have built. I can only say that the more the props have to do (lights, special actions thru remote control, etc… ) , the harder they are to perfect without failing on camera. Norriski writes: “On the commentaries we often here that you are responsible for the food that the actors eat on the show; so what’s the strangest thing you’ve made an actor eat? A-We once made a mixture of rice stick noodles, sweet bean paste and vermicelli. I don’t think they actually swallowed much but we tried making it tasty…if that’s possible. A-We were actually in the Arctic. Antarctica would have been much more comfortable temperature wise : ) The trip and the filming was a great life experience. Martin did mention that he’d have to dress me up, but I didn’t think that I’d be that close to RDA or the camera. Eugene from Aus writes: “1] Will there ever be released specs of some of the props used, such as Ronon’s Gun or perhaps a Wraith Stunner? (and will there be reproductions of them to be sold on the MGM online store?) By specs, I mean like “build-it-yourself” instructions, possibly from scratch or a bought set. A-To tell you the truth…I don’t know. Those kinds of decisions are made by MGM. We just make sure whatever we produce looks and works great on camera. The rest is out of our hands. A-There are a few version of the Ronon guns kept on hand. We have stunt foam/rubbers and hero aluminum versions. I think the count is at 8 right now. 2] Ah, another thing, (not sure if i’m asking the right person), but are you responsible for the heat-resistant gel(featured on many of Bartok’s specials, I believe some on the AoT and some mentions on your host’s blog) , and if so, can you share with us how to make it, or possibly if it’s already commercially released, where to buy it? A-The gel is used by our stunt coordinator James Bamford, and our SPFX department for serious fire gags. I highly doubt the ingredients of the gel is published. 3](unsure if already asked) Favourite material to use for any prop? 4] Favourite prop in general? A-If an actor handles or carries something, it becomes a prop. OK, here is my question for Evil Kenny. How do you go about deciding on the final prop that is use? Do the writers/directors give you an idea or do you get your own idea based on how you interpret something or is it a combination of the two? A-Most of the decisions I make are straightforward. Once a concept drawing has been approved, I sit down with Gordon to see if we can make it work. Sometimes we ask guys like Paco Don and Darren Wright ( model shop engineers ) to join the discussion right from the get go. It’s a group effort really. Most of the time the decisions are obvious and I just let the model shop do their thang. If the build is difficult or complex, my main concern is deciding ‘will it work on set’. That’s when I get really involved. A-Those kind of things don’t bother me cause it happens all the time. The final call on set belongs to the director and the producers. As long as we deliver the props and they work, I’m a happy camper. What is the finger armor actually made of (metal, plastic, other)? A-The finger armor isn’t my department but I think it’s made from a urethane compound…plastic. What is it supposed to be – a manufactured item, or the remnants of iratus bug exoskeleton? What purpose is it supposed to serve – is it just for adornment, or is it a sort of weapon, or tool, or has this not been determined? Strivaria writes: “- As someone whose longtime dream jobs were either astronaut or Star Wars model/prop builder, how does one go about getting into the prop making business anyway? How did you get started? A-Well, I started building props on a feature called ‘The 13th Warrior’ as a laborer. I was new to Vancouver and met the right people who gave me a chance. From there it was a matter of dedicating myself to working hard and listening to people that wanted to share their expertise in the biz. A-Yeah, that’s totally not my call. It may happen one day but only if MGM goes in that direction. Wraithfodder writes: “* What has been the oddest prop you’ve ever had to create? * Once you’re handed a script, how long does it normally take the set folk to dress up a set? A-Usually my guys don’t dress the sets, that’s Set Decorating. * Lots of props folk like to insert a favorite item into each episode; have you guys done the same with SGA? A-I used to sneak my monkey Baba-lou into shots….no really!! * How did you get into doing props for TV? A-A keen interest in film, a desire to help create things that you can’t buy at the mall and a strong work ethic…and lots of luck! A-You know if Martin Wood didn’t give me that name nearly ten years ago I might be called Kenny the Saint….yeah right!!! Answer: If you found that upsetting, then you’re not going to want to hear the rest of the story. But I’ll tell it anyway. You see, initially, we had plenty of money in the budget to submit all of our actors for consideration. But then we started shooting Brain Storm, an episode in which the Keller character attends a fancy party, and while our costume department has done terrific work all year, the producers felt it was imperative that we take matters into our own hands to ensure that Keller (who happens to be our very favorite) look her best. Having done an apprenticeship under Bill Blass and Karl Lagerfeld, I designed Keller’s outfit while Carl, who worked as a seamstress in the lean years prior to landing his gig on Dr. Quinn Medicine Woman, put it all together. We only used the very best of materials and so, when all was said and done, it turned out that we had exceeded the costume budget for the episode. In order to pay for the cost overruns, we decided to take the extra money out of the Gemini submission actor budget. There was just enough money left for one submission so, of course, that went to Jewel because, after all, Keller is our favorite. Anyway, once the other actors got wind of this, they contributed their own cash to replenish the Gemini submission budget, funds formerly earmarked as milk money for their children. The producers took that money and used it to purchase a pair of Jimmy Choo’s for the Keller character. Whatever money was leftover went, not to actor submissions for the Gemini, but toward an truly awesome wrap gift for Jewel that included an all-expenses-paid trip to Montreal, a nice fuel-economical car, and a puppy. The rest of the cast received t-shirts that read: “I WORKED ON STARGATE ATLANTIS FOR 5 YEARS AND ALL I GOT WAS THIS LOUSY T-SHIRT BECAUSE I WASN’T THE PRODUCERS’ FAVORITE”. Answer: A dollar fifty. EACH! Answer: Parents always choose favorites. It’s a normal part of growing up. Answer: So far, very much so. I like it a lot. But nowhere near as much as I like Keller. Answer: Congratulations! Consider using the extra funds to purchase some Jennifer Keller memorabilia. Answer: Hey, how did you know? Did you talk to someone about our idea? By the way, you forget an extra two Keller, Kellers. Answer: Absolutely. The first time Mark Dacascos was in town, he was following a strict vegetarian diet as part of a training regimen for an upcoming mini-series. Chef Belcham and the gang fixed him up with a “vegetarian feast” (which I always assumed was an oxymoron). By the way, you know who else isn’t a vegetarian? 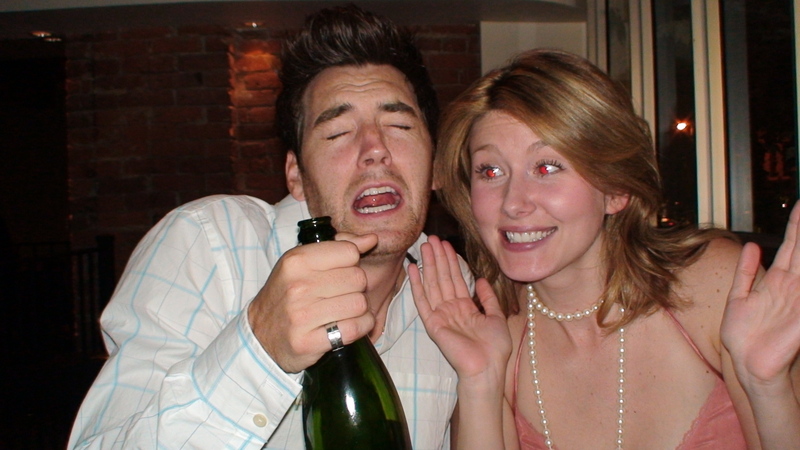 Jewel Staite! Nodaskip writes: “I thought there was? There where 2 mentions of it, both from Carter. Answer: That was an in-story consideration, the notion that the IOA considered giving Sheppard military command. The producers never considered going down that route. Although we did, of course, give some thought to making Keller the base commander. Answer: Yep. There’ll be a bunch – each of which will focus on Keller’s contribution to a specific episode. Answer: From what I’ve heard, it will probably be an all new cast. But we producers are lobbying hard for the Keller character. Answer: Sorry. The Season 5 Gemini Actor Submission budget has already been allocated to the print and publicity campaign in support of Jewel’s 2008-2009 Gemini nomination. Answer: Unfortunately, the American awards submission budget is also being redirected toward funding Jewel’s publicity campaign. Previous Article September 1, 2008: Corn Soup, Crispy Brains, and Mailbag! lol Congratulations to Jewel Straite! So who is this Jewel Staite of whom you write? Do you have a picture of her that you can share? Can’t say as I remember seeing her on Stargate. Perhaps I have been blinded by the combined presence of Joe Flanigan and David Hewlett and Jason Mamoa. Does this mean I’m supposed to donate my bonus to the Jewel Staite so she can get some new stylish shoes? I think perhaps you have come unglued what with all the stress of these last few weeks. I still can’t believe SGA was cancelled. Have Brad Wright and the other guy (sorry, my melted brain cannot remember his name) not yet decided on their producers for SGU? Joe – I officially bow down to you for not just trying durian, but actually carting home an entire fruit. I’ll try just about anything food-wise, but even I had to draw the line when my father summed up durian with the sentence, “It tastes good, but it smells like s**t!” And we’re Pilipino, so there aren’t many foods that gross us out. So, will we see you trying balut or (on a possibly more pleasant note) kaong or halo-halo in the future? Being very Pro Jewel and Pro Keller, I loved the mailbag. Thanks for the laugh. Hi Joe, first thanks to Kenny for stopping by, I have a couple of comments but I will lis them below. Second, thanks for a very funny mailbag today. I have a small exam (40 minutes long) for business statisitics today (in about 20 minutes actually), and reading your mailbag has helped me relax. I had the pleasure to meet someone from the props dept of LOTR a couple of years ago (he came to deliver a lecture during the LOTR Fantasy Literature paper I was taking at the time). 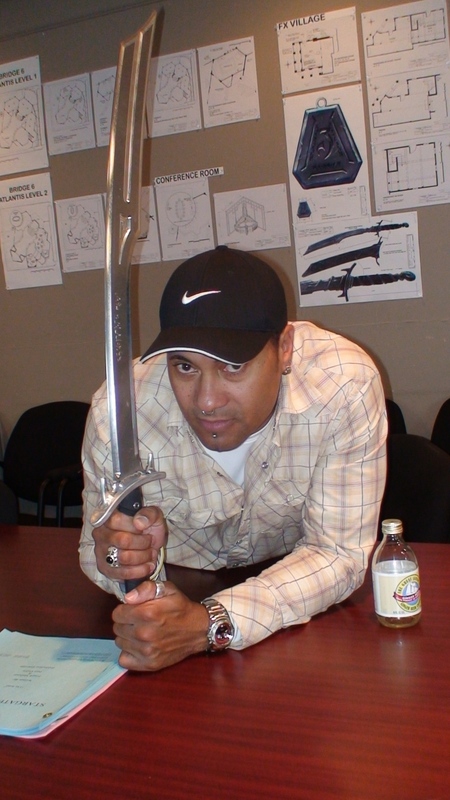 He told us that in FOTR, during the filming of scenes for the action and fight on Weathertop, all the spare and backup swords broke, so the actors who were portraying the Ringwraith standing in the background of the scene had to hold flax leaves that were spray painted with silver paint. A-Props that ‘grow legs’ are as common as surfing the internet! Jimmy Choos???! That is MONEY WELL SPENT! Especially for Keller! I also think that the new movie should be all about Keller marrying McKay (who would change his name to Keller, of course!) and seeing them have five baby girls all named Jennifer Keller! As for Allie… I tried to get her to ask questions for the author. I really did! Maybe we’ll have better luck with the next book. Thanks for encouraging her, Joe. I feel it’s so important for her to try this out. And my stomach did a back flip when I read about your real spider bracelet. @Narelle: Thanks for the welcome back! I hope you can get to a con. They are certainly CONtastic. And thanks for encouraging Allie! She is going to join the BOTMC for sure next month. Or is it this month? Whenever City of Saints and Madmen is supposed to be discussed. Hopefully I will have more free time and can join up again in the future as well. @Anne Teldy: Both Allie and I are eagerly waiting the epi *Whispers* I’m so happy for you that you have a character named after you! SQUEE!!!! Just know that Allie, my mom, my sister, and myself will be very worried about Anne Teldy on this epi! You’re too funny! 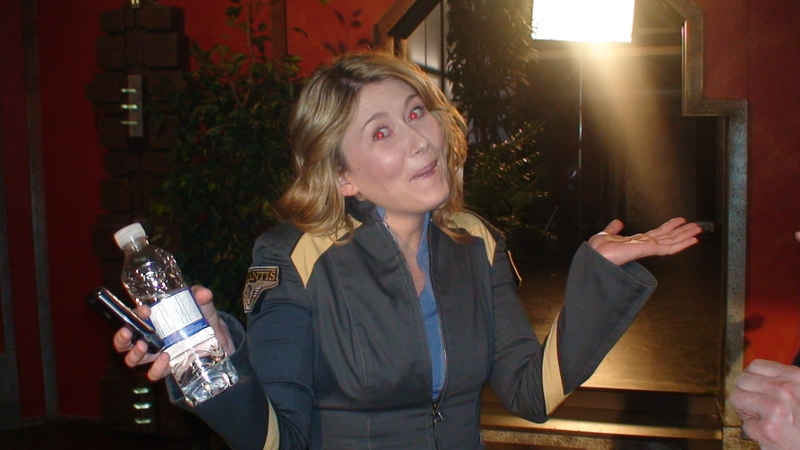 And you forgot to include the “I’m Jewel Staite and I approve this message” on all those answers! It’s also nice to see that the producers put the money donated by the other actors (at least they got a t-shirt out of the deal) to good use and purchased Jewel a nice pair of shoes so that she won’t have to wear a pair of beat-up runners when she accepts the Gemini. Wow, Joe. You are certainly being naughty today. LOL. Favor to ask. At the ‘wrap party’ for S5 and the show’s end could you please take lots of pictures for us? And at risk of being injured could you sneak in a few of JF? Take them while he’s not looking. Maybe he would be okay with a team pic. I’ll take responibility for any injuries you might happen to receive. Loved the Keller-o-riffic mail bag! Joe, I’ve been reading your blog regularly for several months now–and enjoying it immensely. I’ve spent the last 20+ years working in Human Resources and have to tell you that I appreciate your sense of humor in light of all the flack you get. If you can’t please all of the people all of the time, you might as well tick some of them off all of the time, right? After a while, all you can do is laugh. Because the bump on your forehead from pounding your head on the desk hurts too much to keep doing *that*. Thank you (to you and the other writers, producers, cast and crew members) for 4 great years and a 5th that has been outstanding so far! Today’s blog on Keller was HILARIOUS!! I started reading and then I starting laughing, and then I started laughing so hard I started crying! I SO needed this today! I had a really bad day today at work and to come home and read this, just made me lose all my built up hostility and enjoy the rest of the evening. Thanks! And the weird food of the day, a perfect ending to today’s blog. Awesome mailbag today. 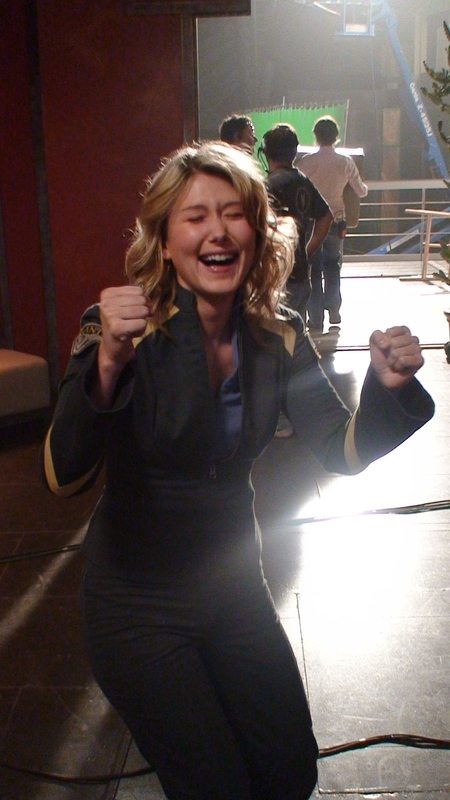 However, you didn’t mention if Keller would be in the next SG-1 movie. Please let that be true! being Pro-Keller, i loved the mailbag, and many congrats to Jewel on her nomination!!! I saw a pug this past weekend and of course thought of you and the pooches. Even though I’ve seen plenty of your pictures I did not realize that pugs were so small. He was about the size of my cat. The dog was a fawn pug just like Jelly and Bubba but seemed to be contrary just like Maximus. A man was taking the dog down the street for a walk when the dog just laid down and would not budge until the man started to walk in the opposite direction. I wonder if contrariness is a common trait in pugs. I hope you have a Kellerific evening! AHAHAHAHAHAHAHA. I’m about to walk into a meeting with tears in my eyes. I’m drawn to the Keller character more after all of the abuse she has been receiving. 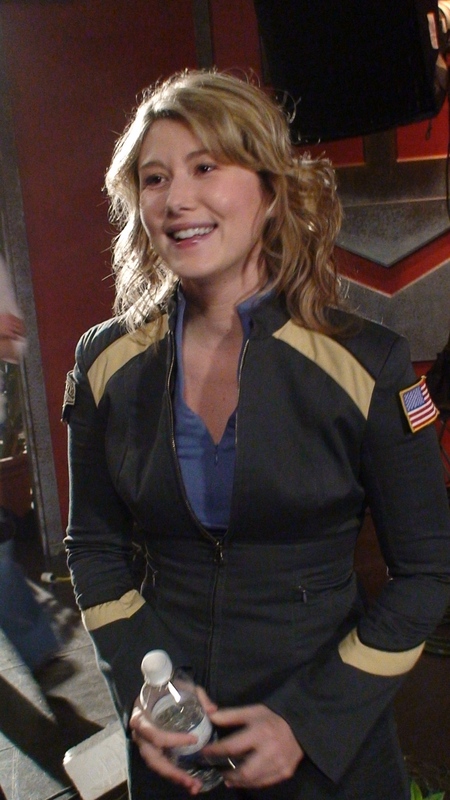 Jewel Staite must be a real trooper. And I’ve noticed her hairstyles seem to have a lot more time put into them – a few more curls, a bit more body. Another redirection of production funds? I always think of questions after the guests have been on! I was wanting to know if the object in the centre of the Genii flag is based off a conference call speaker that sits in the middle of the table. Look forward to seeing the Durian video when I can watch it without raising any eyebrows around me. They are a favourite in Thailand. And wow do they smell bad. You NEVER show enough Jewel Staite a.k.a. Dr. Jennifer Keller on your blog, what gives? One would think she was no longer the producer’s favorite SGA actor or something, gee whiz. And I hear she’s been nominated for a Gemini award too! Snicker-snicker… okay — “WE GET IT, you are so-o-o tired of fencing comments about Staite/Keller. What is husband Matt trying to do? Squeeze the wine bottle, or grim mace? That’s what I call an odd, caught-in-the-moment expression. Jewel seems nonchalant about it though. “Evil” Kenny’s exploits throughout the Stargate reality are much appreciated. And I do hope YOUR abilities and creativity continue to be utilized on all SG projects for a long time to come Joe. Wow Joe. I remember when visiting your blog used to be a high point of my day. Food pictures, behind the scenes peaks at the cast, hints at script titles, spam emails, you name it. After reading this post those days seem a long time ago. So some people don’t like Keller. That certainly doesn’t mean that they dislike Jewel whom I met at a recent con and found to be a very sweet person. So what if some people don’t like this character? I’m sure there’s a large contingent of unheard from fans who read your blog and don’t like McKay, Sheppard, Ronon or Teyla. Why does the negative Keller criticism bother you so much? Still, Atlantis is leaving after this year and I’ll miss it a heck of a lot more than is probably normal. I may not have liked every episode, character or plot development, but I’ve loved the show and the team enough to criticize it, discuss it, lurk online and read about it voraciously. Thanks for five great seasons. I loved the Kellerific mail-bag! Joe – I just wanted to know if there is a phone number or website that I can use to contribute to the fund to support Keller in her bid? And to “Evil” Kenny – Thanks! You have made my day with your Keller blog! Love the pictures—-Jewel is a great sport.